Wave Shield by Adafruit – Worked the first time! I knew my interest in electronic music and the maker movement would come together at some point. It was just a matter of when. The first catalyst, back in 2012, started when an artist friend wanted to trigger sounds for a sculpture. Many people had done this in various ways, long before Arduino, but the control possibilities and flexibility of Arduino were intriguing. Around the same time as my friend was working on her project, I attended EM2012 where Kevin Meredith and Rebecca Mercuri gave a workshop on the GRELMO Arduino device. I thought it would be a cool project/gift for my dad – a life-long electronics builder and experimenter. The GRELMO kit didn’t come with an Arduino main board though. After researching what I needed to complete the GRELMO for my dad, I picked one up for myself to do some experiments. Triggering sound was often done using one of the third-party shields on the market, so after a bit of research I jumped in with the Wave Shield by Adafruit. It came as a kit, with some soldering required. It went together in about two hours thanks to the great online instructions. Within a very short time I had it up and running with very little coding (awesome!). It was an encouraging start. All I needed to do was make a few changes to my haphazard electronics bench and get a few more tools to jump in further. 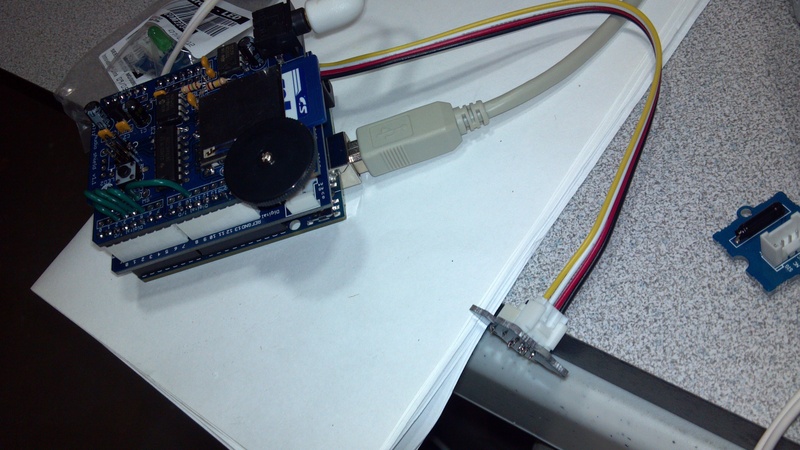 With the Wave Shield assembled, I added a Grove Sensor shield and experimented with various ways to trigger sounds. Eventually my artist/sculptor friend who sort of triggered this journey had some health issues and became distracted from her plans and we never got back to adding sound to an actual project, but all the pieces were in place. For many things the Wave Shield would be fine, but it only did low quality files, and only mono. It was also a bit bulky, and dedicating an entire Arduino Uno for such a project is a bit overkill. 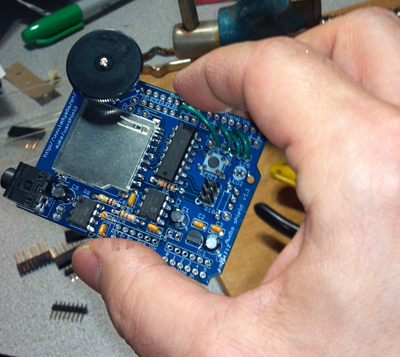 In future experiments I explored audio boards from other manufacturers. More on those as I go.